Training with a POWER FIT-PLATFORM machine is an ideal alternative for all people who don’t have the time required to train but they really want to be fit and seek to decrease their body fat and at the same time tighten their bodies’ structure. 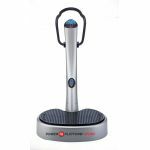 The advantages of using a POWER FIT-PLATFORM are multiple since it can help you enhance your blood circulation and work all of your muscle groups easily, quickly and effectively. The vibrations (waves) produced by the POWER FIT-PLATFORM machine cause muscle contraction which can be very intense depending on the selected frequency. At higher frequencies, the machine’s waves can reach up to 50 per second. Based on the platform you choose, these waves can be either vertical or lateral or even three-dimensional. Training with a POWER FIT-PLATFORM is a very convenient way to fortify your body by training with high intensities without hindering or hurting your joints and skeletal muscles. You can easily use this modern alternative way of training that makes every exercise a real joy, by choosing from bodybuildingclub the machine that suits most with your personal needs. Just 15 minutes of exercising with a POWER FIT-PLATFORM are equal to 1.5 hours of hard training at the gym. Each platform helps toning all your muscle groups, enhances your physical condition, increases muscle mass, burns excessive body fat and fights cellulite and skin loosening.